Liquid milk can be divided into two kinds of milk which are normal temperature milk and low temperature milk. Normal temperature milk: Normal temperature milk is made by instant sterilization at 137 degrees high temperature. Although Normal temperature milk is more suitable for long term storage and transportation, due to the high temperature sterilization process, the majority of nutrition will be lost. While nutrients in low temperature milk would much higher than normal milk. Low temperature milk: Low temperature milk will be disinfected by slowly heated at the temperature between 60 ℃ to 85 ℃, which is also known as pasteurized milk. The advantage is nutrient-rich, while the short storage period, and all processes require refrigerated transport. In order to prevent the growth of bacteria, the low temperature milk should be stored in the temperature between 2℃ to 6℃ during the transportation. Moreover, the requirements of temperature should be kept in high level, the whole process need be conducted under the temperature control including milking, storage, transportation and sale. As a result of low temperature milk, shelf life is basically about 7-21 days. While, the importation of fresh milk take at least 2 to 4 days to reach retail terminals. The domestic transportation should take at least 4 hours as well. The transportation efficiency has become a vital problem for low temperature milk transportation. For the sellers of low temperature milk who sell these milk online, due to the package solution is damageable. The transportation is easy to squeeze which will cause the leakage and other problems. In order to help more consumers drink nutrition, safe and healthy low temperature milk, JIUYE Supply Chain has integrated various resources from suppliers to logistics service providers for visualization of low temperature milk logistics service. In addition, the integrated resources can provide custom clearance service and professional package solution which can reduce the intermediate links, and increase the efficiency of transportation. firstly, the receiving temperature will be measured. Then, inspect no less than 30% of the products arrived. According to the customers’ requirements for inspection, receiving the products after checking without any defects. store the low temperature milk in the temperature zone within 2~6℃. since the characteristics of fresh milk is fast selling products, it is necessary to store low temperature fresh milk near the delivery area. picking up products according to the customer’s requirements after arriving. packing according to the customized package solution provided by JIUYE Supply Chain. 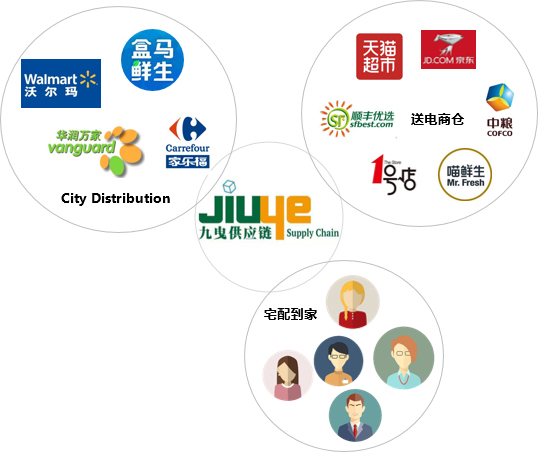 JIUYE Supply Chain can provide distribution service to ecommerce-platform warehouses, supermarket warehouses and customers for low temperature milk meeting the various distribution requirements of customers. Ensure that the low temperature fresh milk arrives at the sale terminal or the consumer hand, the shelf life is not less than 1/3.